Each year at the World Superyacht Awards, one special accolade is awarded to an owner. The Voyager's Award celebrates owners that have made extensive use of their yachts in long distance voyaging and exploration over the past few years. Here, we bring you the three finalists of the Voyager's Award. 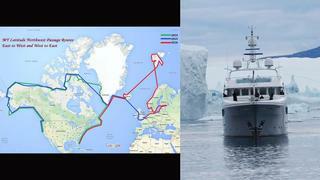 Latitude proves that an explorer yacht doesn’t need to look like one, having successfully traversed all 3,500nm of the Northwest Passage despite not being Ice Strengthened. The trick, according to Bart Bouwhuis, creative director of Dutch design studio Vripack, is that the yacht needs to be designed with an explorer’s heart, a no nonsense attitude, and contain hundreds of smart solutions. An explorer’s heart is certainly found in her owner, who took Latitude on a near 11,000-nautical mile trip that started in Fort Lauderdale and lead him and his family to New York, Newport, Rhode Island, Greenland and through the Northwest Passage from the Atlantic to the Pacific coast. It wasn’t easy for Latitude's owner and crew, who spent four months preparing the trip. They had to hire an experienced local captain and an ice expert to help them navigate, since Latitiude’s captain Sean Meagher had been warned the charts were inaccurate by miles. But their unique voyage brought the delights of the Northern Lights, the spectacle of watching wildlife like polar bears, and many close encounters with icebergs. Subsequently, Latitude then passed through the Northwest Passage in an easterly direction, making this is a double voyage. Each year at the World Superyacht Awards, one special accolade is awarded to an owner. The Voyager's Award celebrates owners that have made extensive use of their yachts in long distance voyaging and exploration over the past few years. Here, we bring you the three finalists of the Voyager's Award. Latitude proves that an explorer yacht doesn’t need to look like one, having successfully traversed all 3,500nm of the Northwest Passage despite not being Ice Strengthened. The trick, according to Bart Bouwhuis, creative director of Dutch design studio Vripack, is that the yacht needs to be designed with an explorer’s heart, a no nonsense attitude, and contain hundreds of smart solutions. An explorer’s heart is certainly found in her owner, who took Latitude on a near 11,000-nautical mile trip that started in Fort Lauderdale and lead him and his family to New York, Newport, Rhode Island, Greenland and through the Northwest Passage from the Atlantic to the Pacific coast. It wasn’t easy for Latitude's owner and crew, who spent four months preparing the trip. They had to hire an experienced local captain and an ice expert to help them navigate, since Latitiude’s captain Sean Meagher had been warned the charts were inaccurate by miles. But their unique voyage brought the delights of the Northern Lights, the spectacle of watching wildlife like polar bears, and many close encounters with icebergs. Subsequently, Latitude then passed through the Northwest Passage in an easterly direction, making this is a double voyage. 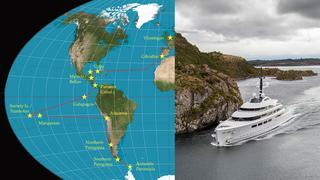 Salperton started in Palma de Mallorca in 2013 and for 16 months cruised the Atlantic, Pacific, and Southern Oceans. This voyage took in Antigua and the San Blas Islands before the superyacht sailed through the Panama Canal and on to the Galapagos Islands. In the Pacific, Salperton stopped off at the Marquesas Islands, the Tuamotu Islands, Tahiti, Fiji and New Zealand, before cruising through the Southern Ocean past Chile and on to the Falkland Islands, Uruguay, Brazil, Cape Verde and back to Gibraltar, ending the trip in April 2015. Highlights for her owner and his guests included the many opportunities to dive during the voyage, particularly at the South pass of Fakarava. There, the current pushed them along the pass and gave them the chance to watch hundreds of sharks and an abundance of colourful fish. In the colder climes of Patagonia, the crew of Salperton witnessed the most majestic wildlife, with whales flipping up their tails, as well as lots of penguins and albatross. Her owner plans to build a new, larger yacht, once he’s nailed down the exact specs he desires and he's chosen a suitable yard, so more adventures are likely in his future. Salperton started in Palma de Mallorca in 2013 and for 16 months cruised the Atlantic, Pacific, and Southern Oceans. This voyage took in Antigua and the San Blas Islands before the superyacht sailed through the Panama Canal and on to the Galapagos Islands. In the Pacific, Salperton stopped off at the Marquesas Islands, the Tuamotu Islands, Tahiti, Fiji and New Zealand, before cruising through the Southern Ocean past Chile and on to the Falkland Islands, Uruguay, Brazil, Cape Verde and back to Gibraltar, ending the trip in April 2015. Highlights for her owner and his guests included the many opportunities to dive during the voyage, particularly at the South pass of Fakarava. There, the current pushed them along the pass and gave them the chance to watch hundreds of sharks and an abundance of colourful fish. In the colder climes of Patagonia, the crew of Salperton witnessed the most majestic wildlife, with whales flipping up their tails, as well as lots of penguins and albatross. Her owner plans to build a new, larger yacht, once he’s nailed down the exact specs he desires and he's chosen a suitable yard, so more adventures are likely in his future. Before her refit VaVa II had already circumnavigated the globe. As soon as her refit at Amels was complete, she set off on another incredible journey. This time, beginning in February, she set sail for Cuba, via Gibraltar, where guests kite-surfed and golfed on the north coast, toured La Habana in vintage cars and went scuba diving off the pristine beaches of the south. With a brief pause in Mexico, VaVa II stopped in Belize to visit the newly created Turneffe Atoll Marine Reserve, and made her second transit through the Panama Canal before reaching the Galapagos Islands. This part of the leg let guests explore the islands for 10 days, taking in the tame wildlife and completing scientific missions. A tour through Polynesia followed, with the busy Society Islands and flat terrain of the Tuamotus offering exciting changes in scenery. It took 18 days to cross to northern Chile, and after a stop to explore the mainland, Vava II sailed on to Patagonia. Her owner and his guests and crew spent Christmas Day in south Patagonia, where they enjoyed heli-skiing in the mountains before they headed for Antarctica. The final leg took in the Larsen Ice Shelf, King George Island and the Chilean Frie Station research base. The furthest south that VaVa II sailed was 65 07 S, the transit of the Lemaire Channel. “The distance travelled, ports visited and oceans traversed over the last 12 months, combined with some incredible experiences, have made this a most memorable year for VaVa II, her guests, and crew,” said captain Richard Bridge. "Vava II is presently in Cape Town undergoing maintenance and 2016 is shaping up to be yet another fantastic year – long may it continue." Before her refit VaVa II had already circumnavigated the globe. As soon as her refit at Amels was complete, she set off on another incredible journey. This time, beginning in February, she set sail for Cuba, via Gibraltar, where guests kite-surfed and golfed on the north coast, toured La Habana in vintage cars and went scuba diving off the pristine beaches of the south. With a brief pause in Mexico, VaVa II stopped in Belize to visit the newly created Turneffe Atoll Marine Reserve, and made her second transit through the Panama Canal before reaching the Galapagos Islands. This part of the leg let guests explore the islands for 10 days, taking in the tame wildlife and completing scientific missions. A tour through Polynesia followed, with the busy Society Islands and flat terrain of the Tuamotus offering exciting changes in scenery. 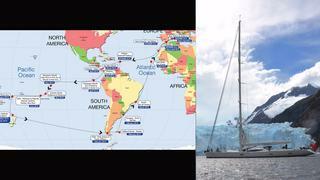 It took 18 days to cross to northern Chile, and after a stop to explore the mainland, Vava II sailed on to Patagonia. Her owner and his guests and crew spent Christmas Day in south Patagonia, where they enjoyed heli-skiing in the mountains before they headed for Antarctica. The final leg took in the Larsen Ice Shelf, King George Island and the Chilean Frie Station research base. The furthest south that VaVa II sailed was 65 07 S, the transit of the Lemaire Channel. “The distance travelled, ports visited and oceans traversed over the last 12 months, combined with some incredible experiences, have made this a most memorable year for VaVa II, her guests, and crew,” said captain Richard Bridge. "Vava II is presently in Cape Town undergoing maintenance and 2016 is shaping up to be yet another fantastic year – long may it continue."